Ahh 2007. Here it came and there it went. Thank you so much for all your support and encouragement in the past year, I honestly don't think the blog would have lasted this long if it weren't for such faithful blog friends that leave lovely comments and visit every week. If If it were possible, I would call for a virtual group hug right now. You all have put a smile on my face and I can only hope that the blog does the same for you. I just wanted to wish all of you a Happy New Year and hope that 2008 is a cracking good year for you and your family. 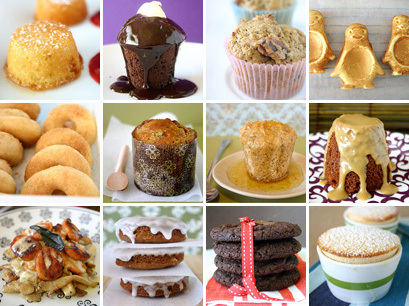 Here's a little glimpse of what was cooking in my kitchen the past year. Hope the next year is just as delicious. Ahh Christmas. I can't believe that it has just come and gone. And although many a swine and perhaps turkey are breathing a collective sigh of relief now that their juicy tender flesh are no longer being eyed off as delectable cuts of Christmas meat to be proudly set down on one's dinner table, I can't help but think how much quicker and quicker the Christmas season rolls by every year. I know I've had my fair share of ham and turkey and of course the obligatory seafood bounty that is the cornerstone of every Aussie Christmas, but I cannot overlook one of the very reasons why I love Christmas down under, it's that Christmas is smack-bang in the midst of our summer. And although we are experiencing what I have affectionately coined as the summer that never was, the sun turned out for a gloriously sunny Christmas day. Seeing the sun was quite heartening, seeing as that we are looking at the prospect of only 4 sunny days in December, according to the weather people and it appears that we have already had them all. 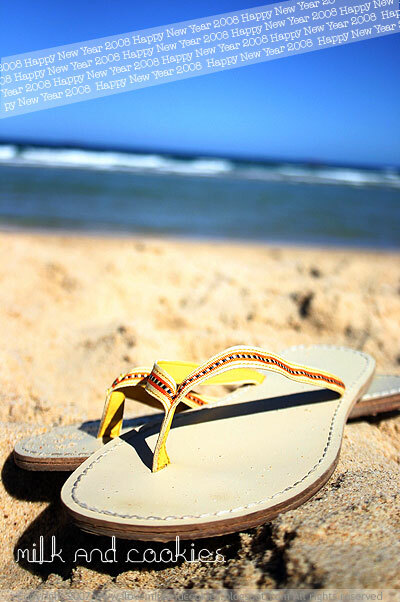 With a typical all-Australian summer comes the sun and the flies, which can be cause for contempt for many Australians and a lot more non-Australians who just cannot handle the sticky weather and the flies that tend to stick. The flies are indeed everywhere, and annoyingly so, although the good weather has been somewhat remiss. However, thunderstorms and absent sunshine aside, one thing that makes my heart beat that little bit faster is the prospect of summer berries. Of all the genus of fruit around, I think the berry is my most favourite. They come in so many varieties, so many colours and so many flavours, what's not to fall in love with? 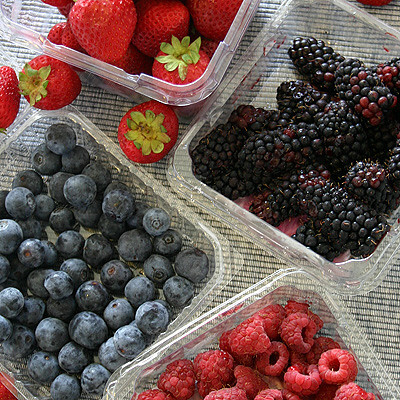 Berries in the summer, mean berries for Christmas and what doesn't scream festive more than the look of summer berries. Hues of deep blue, magenta and violet and bright tones of crimson, ruby red and green the palette is endless. 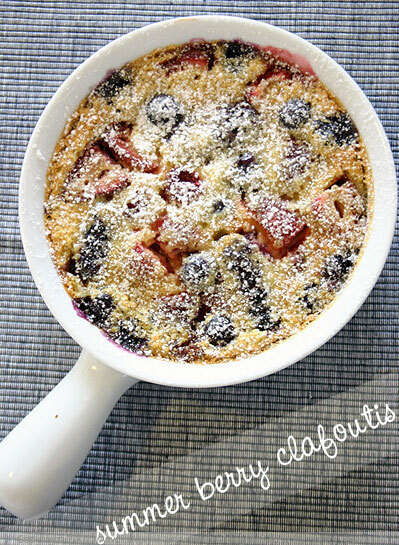 As much as I cannot go past the humble strawberry, probably the most popular of all berries there are so many others that are ripe for dessert, and a great way to showcase one of summer's bounties is in a berry clafoutis. A dessert that originated from France and was traditionally made with cherries, the modern clafoutis, I think can be made with just about any fruit you can bake. Although clafoutis purists adhere strictly to cherries, I think this dessert is versatile enough for a change. 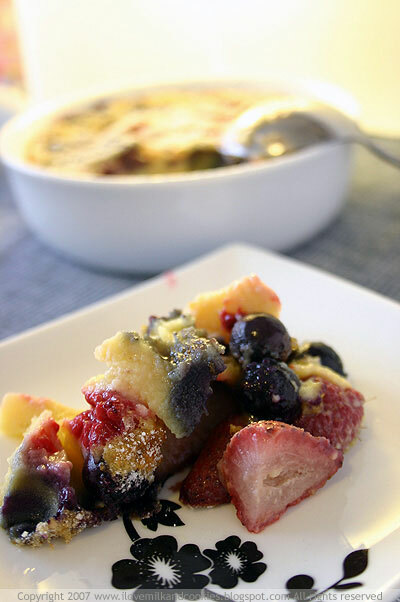 You can pretty much include whatever berries you wish in this dessert's and if berries aren't your thing then stone fruits like peaches and apricots are a great substitute. Even though, strictly speaking, raspberries and blackberries aren't considered to be true berries in the botanical sense, there's no need for being exclusively botanic in your interpretation of a berry clafoutis. Feel free to throw in anything that ends with a the word berry. I'm sure the result will be just as fantastic. The verdict? This recipe yields a smooth and light dessert that is perfect after Christmas when we have all had a little bit too much to eat and drink. Althought it's made up mostly of cream and eggs, the dessert is not at all rich and filling like a crème brûlée would be. 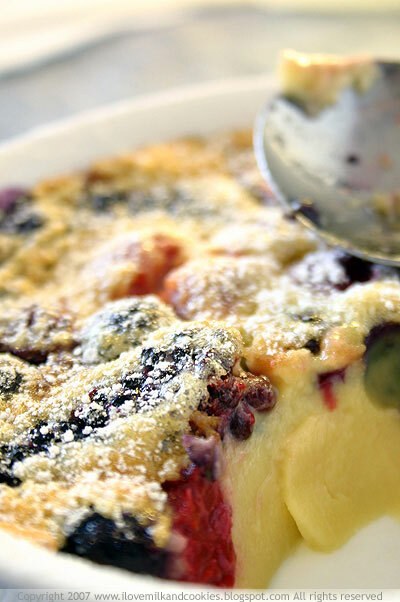 And the tartness of the berries create a nice contrast to the sweetness of the custard. 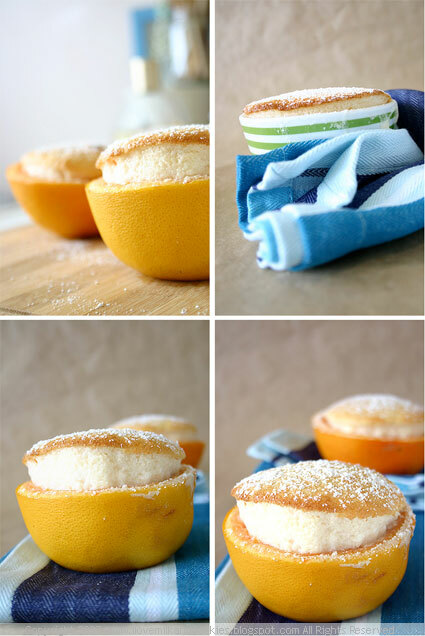 Perfect with a glass of champagne if your feeling celebratory or just a simple glass of moscato (Tempus Two is my favourite) this dessert is an easy crowd pleaser and one you can pull out for any dinner party. 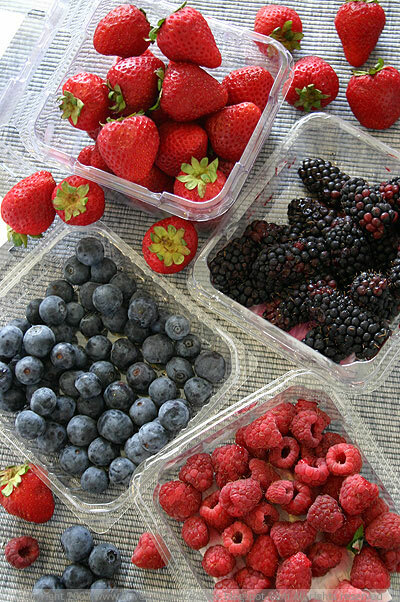 So take advantage of the surplus of berries right now and perhaps make up for the lack of sunshine this summer. Brush oven proof dish with butter. In a medium bowl combine eggs, sugar, cream and vanilla extract and whisk until frothy. Sift flour over egg mixture and whisk until smooth. Pour batter into prepare oven proof dish and scatter berries evenly throughout the dish. Bake for 55 minutes to 1 hour or until the centre has just set and golden. 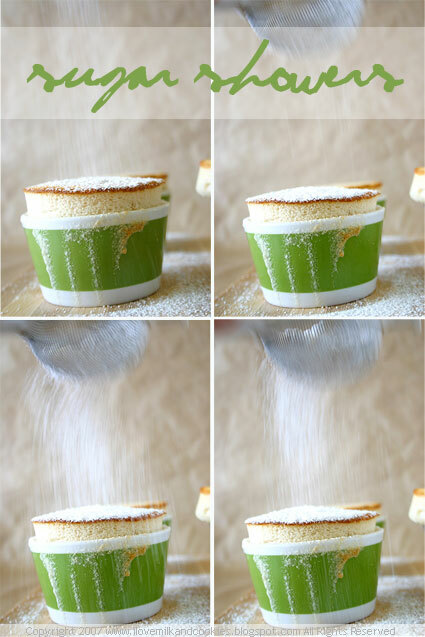 Remove from oven and dust with icing sugarto serve. Hope you all had a very Merry Christmas and are looking forward to 2008. It's been a crazy past 2 weeks and in my absence it's been pretty quiet around here at Milk and Cookies, I'm sure you have noticed. I had planned on a really thoughtful Christmas post just before the Yule to wish everyone a nice Christmas, but I guess that thought just never came to fruition. I had panned on baking a really nice fruitcake or perhaps posting about a chocolate panettone recipe, however that I never got around to either. So I'm sorry I haven't been more attentive to the blog of late, although there hasn't been a lack of food and eating, I can assure you of that. And although this may sound a little trite and overdone but I really do count it a privilege to be able to blog, and of all things, blog about food. I know that most of the world's population do not have such frivolity to indulge themselves in and know that this food blogging thing is a concession I don't want to take for granted especially when our subject matter is something of an unfathomable luxury in other nations. 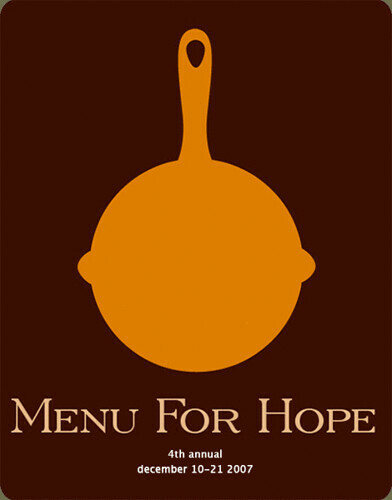 So I just wanted to briefly appreciate all those of you who were able to show their generosity for this year's Menu For Hope and of course to all of those who were involved in making it happen in every region and undoubtedly Pim, of Chez Pim who has been at the helm of this fundraiser for the past 4 years . We have completely eclipsed last year's total by an astounding $29.360.88 (USD). 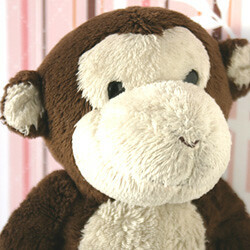 And according to Pim's blog the total now stands at $90,286.00 (USD)!!! Geez-Louise! So good luck to all those who are in the raffle, I know I am crossing my fingers, hoping and wishing that I win this year. I have my eye on a certain prize- AP38. Winners will be announced on Chez Pim, Wednesday January 9, 2008. Summer where are you? I checked under my bed and you weren't there, I checked under the rug and in between the couch but you weren't there. I looked through the drawers and even through my dirty laundry but alas you were nowhere to be found. Who has stolen our summer away? After weeks of continual rain and this freak of nature that has turned some parts of our city into a state of emergency, many are starting to wonder what ever happened to summer. The official start of the summer season was supposed to be the beginning of this month, but since then I can only recall one perfectly sunny day and that was my birthday. If only there was a way of willing summer back by clicking my heels three times like Dorothy but it looks like the wet and at times kooky weather is going to continue on for a few more weeks. Oh how I miss summer. The summer berries and stone fruits are back but the weather to accompany them somehow absent. It just doesn't seem right to go through a pile of berries, looking out your window at a grey sky. It just isn't Sydney without the incapacitating heat and the sun beating down at you with the force of a thousand flames. As much as I love to complain about the heat, I really would like the humidity and the sun-stroke inducing weather back. But either way grey skies or blue, I think I will probably grumble either way. 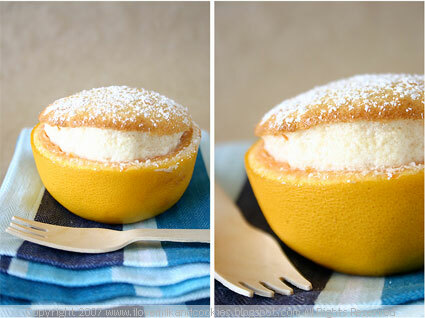 So in an effort not to be such a whiner, I decided to get into the bleak and cold weather with a dessert that's more a wintry treat than a summer delight. 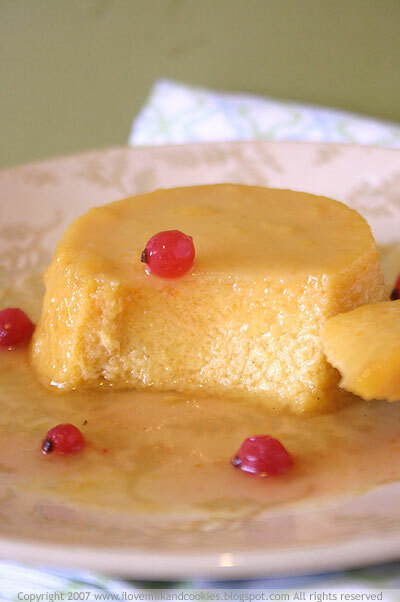 Sweet Potato Flan. How thanksgiving is that? There's nothing that says hibernating in the dead of a cold winter than a sweet potato, there's something about its sweet starchiness that screams out comfort food. 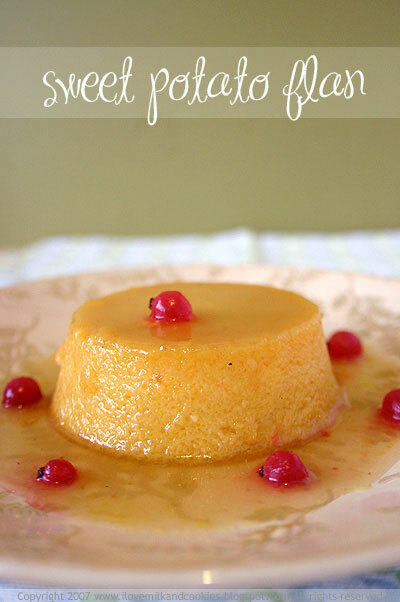 So what better way than to revel in all this cold weather and the advent of Christmas than with this flan. 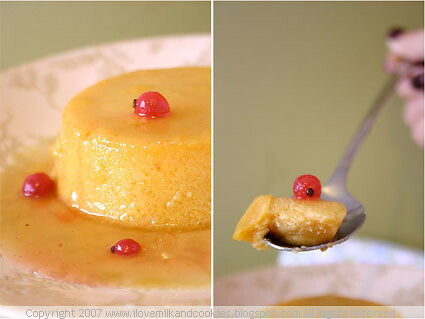 Similar to a Filipino dessert called leche flan this sweet potato flan is made in the same way. I've been cooking from a lot of blogs lately, and it's no surprise that this recipe came from Meeta's blog, I've been gleaning ideas from this girl for some time now as her site is a trove for all things delicious. I've always wanted to make a dessert using sweet potato although I never wanted to turn it into a pie, so the flan was the perfect idea. At first I was quite apprehensive in incorporating sweet potato into a perfectly good creme caramel recipe. Why ruin a good thing? But there's no taking away from the dessert, it can truly stand on its own. The taste is quite subtle and there's no glaring sweet potato flavour staring in you in the face. It's not to sweet and it's not too rich. It's actually incredibly smooth and refreshing. 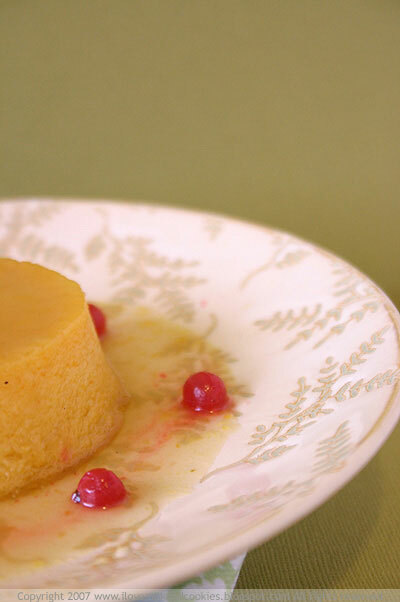 And if you're looking to add just a little summery touch to these flans, then go ahead and add some berries to the flan. I decided to go with some redcurrants I had lying around the tangy bite of the redcurrants pairs beautifully with the sweetness of the flan. Place the thick potato slices on a baking tray lined with baking paper. Roast in the oven for about 30 minutes until the flesh becomes soft enough for mashing, making sure they do not become too dark. Put the slices in a food processor and add the lime juice; puree until smooth. Reduce oven temperature to 180°C. Strain pureed sweet potato through a fine meshed sieve to get it really smooth. Stir half of the sugar and 2 tbsp water in a medium saucepan over medium-low heat until sugar dissolves. 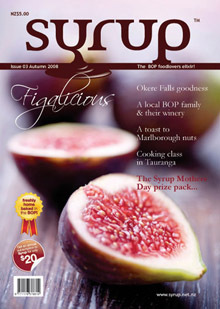 Increase heat to high and boil without stirring, until the syrup turns a deep amber color, occasionally swirling the pan. This should take about 5 minutes. 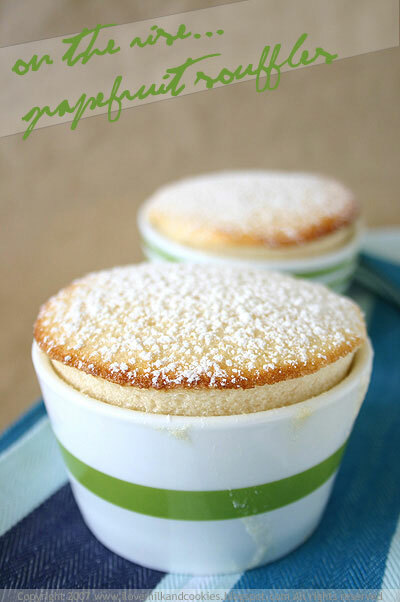 Immediately pour caramel into small ramekin bowls or one larger oven-proof dish. Save about 2 tablespoons caramel in saucepan. Swirl each ramekin form around, allowing caramel to coat bottom and about 1cm up the sides. Add the milk to the remaining caramel in saucepan. This will cause the caramel to solidify but don't worry keep stirring over medium-low heat until the caramel dissolves. Whisk eggs in another bowl until frothy. Whisk in cream, salt, sweet potato puree, and remaining sugar. Gradually whisk in hot milk-caramel mixture then strain back into same saucepan. Stir over medium heat for about 1 minute. Remove from heat; whisk in Port. 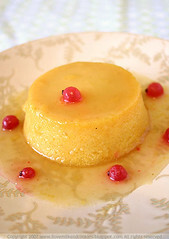 Pour custard into prepared ramekins. Place the ramekins in a large roasting pan. Add enough hot water to the roasting pan to come halfway up sides of ramekin forms. Chill until cold for about 5 hours or overnight. Just before serving dip each ramekin bowl into a pan of hot water for about 15 seconds. Wipe dry. Invert onto serving plates; serve with redcurrants if desired. Yay Pie! and Hooray for Bananas! 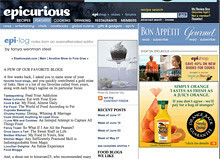 blogger Ames has generously presented me with the Yummy Blog Award, and I graciously accept! 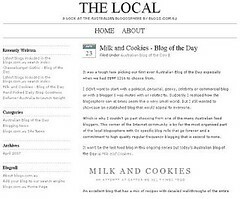 Thanks so much Ames for the honour and my first duty as the newest inductee into the Yummy Blog hall of fame is to dub another yummy blogger with the award. I guess it's a sort of pay it forward system in the blog world. 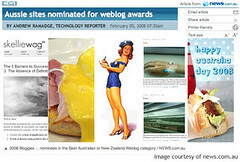 The Yummy Blog Award is a hard one give away, where do I start, there's a plethora of yummy blogs out there and many worthy of being awarded. It's almost as hard as picking what I'm going to wear every morning so I thought I would give it a couple of days of thought. So after a few days it wasn't hard to finally settle on this particular blog, one that I have only recently discovered, but have instantly loved. I am passing on the Yummy Blog Award to Karen the Mad Baker, she proclaims to be mad about pastry, cakes and all things baked and I have to say I cannot find any evidence to the contrary. Her sweet concoctions are so enticing and I don't think anyone out there can ice a cookie as well as she does (I'm insanely jealous). So instead of trying to beat her at her own game I thought that I would just honour her with an award that she more than deserves. 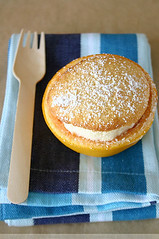 And if you happen to live in Singapore then you are in luck, Karen takes orders for her scrumptious cakes. And if you ever doubted how yummy she actually is, well she's all booked out this Christmas. So you have to satiate your curiosity for her cakes in the next year. We just got hit by a massive hailstorm. I was taking a lazy Sunday afternoon nap to recover from a big weekend but was awakened by the sound of loud thunder claps and the ear-splitting racket of what sounded like bombs exploding. 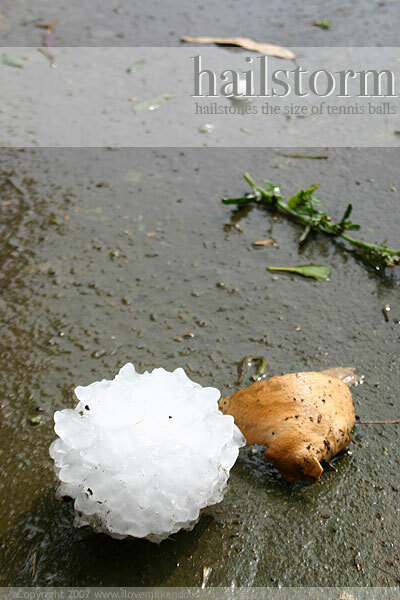 The storm lasted for about 15 minutes and started off with pea-sized and golf ball-sized hailstones, although about 5 minutes into the storm it took a turn for the worse when the storm started dropping hailstones the size of tennis balls. 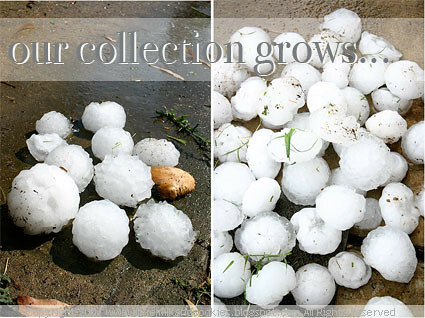 Our yard was littered with enormous hailstones but didn't completely cover the yard, although they packed enough of a punch to put holes in roofs and dent cars. 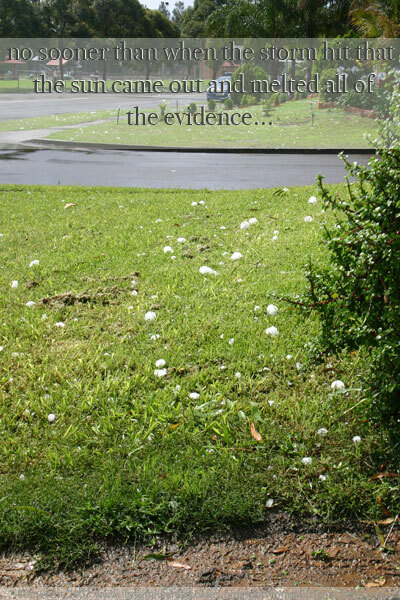 No sooner than when the storm hit that the sun emerged from its grey shroud and melted all the hail, leaving tennis ball-sized craters as evidence. We were lucky enough to escape with only a few cracked tiles on our roof although some people weren't as fortunate. Good luck to all those cleaning up after the storm. I turned 26 yesterday! Last year, for my quarter-century celebration, I lived it up in "sunny" Melbourne. This year, I was tossing between going back south to shop it out or just staying in Sydney and having a big do. Although when it came to crunch time, I opted for spending the weekend with just a few of my closest friends. It started off with a birthday eve dinner on Saturday night at my friend I and H's house with some beautiful homemade lasagne, a few bottles of McGuigan's wine and a chocolate birthday cake (sans the candles, thank goodness) to top off the meal. The wine always makes for an interesting night that ended with a few misadventures that we will definitely look back on in a few years and laugh about. 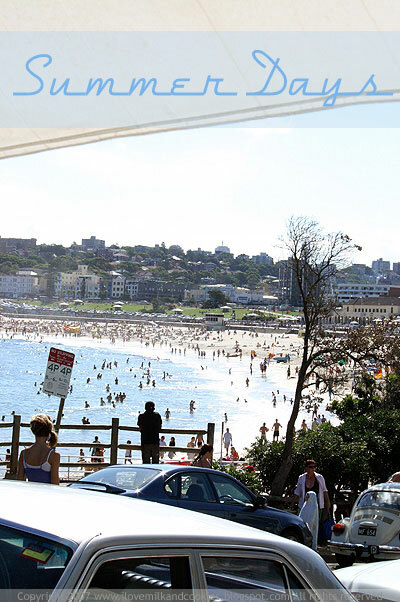 Sunday, was spent in a more leisurely fashion with a trip to the markets with the girls and a visit to Hurricane's Grill at Bondi Beach. 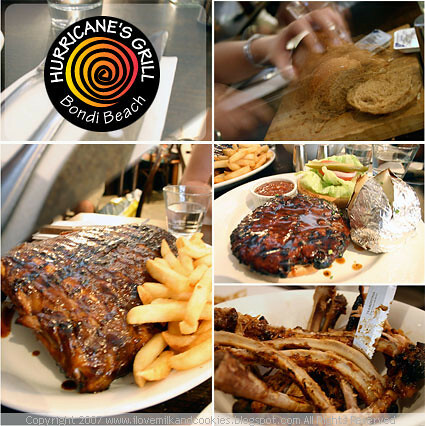 Almost as iconic as the Beach itself, Hurricane's is a carnivore's delight. The place does have a meagre vegetarian selection but the amount of carnivorous feasting going on would probably be too offensive for sensitive vegetarians. Especially when one of their signature dishes is a full rack of pork or lamb ribs that includes a "standard issue" bib and moist towel to catch and wipe the juicy aftermath of all the rib-eating. There were four of us girls however we only ordered two dishes. If you ever see the portion sizes of these dishes you will probably understand, and all for a reasonable price. A full rack of ribs with chips ($30) and a 300g beef burger with monkey gland sauce and baked potato ($17), was shared between the four, and none of us left the restaurant lacking. And as you can see, every rib was cleaned to the bone, every piece of flesh proudly gnawed off and our fingers bore testament to our satisfaction. If you are wondering what the monkey gland sauce was about, well let me assure you that no monkeys were hurt in the in the making of this sauce and nor are there any glands involved. From what I gather, and I'm sure that many South Africans can better explain, monkey gland sauce is a tomato based bbq sauce that tastes somewhat like a relish or a chutney. It can be made with various of ingredients however most sauces usually contain tomatoes, onions, Worcestershire and Tobasco sauce.